A successful team includes bold dreamers (Visionaries), pragmatic realists (Operators), and systems designers (Processors) but it takes a Synergist to blend the motivations and goals of the three types and get everyone to work together effectively. 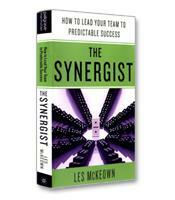 The Synergist puts aside his or her own agenda and captures the best input from each team member. Anyone can learn to be the Synergist and fill this critical role in teamwork improvement. The Synergist reveals a proven method to build highly successful teams while stimulating personal and organizational growth. How to recognize the signs of ineffective teamwork. How to make the right interventions at pivotal moments. What your team needs to succeed. How anyone can learn to be an effective Synergist.